Attracting and retaining a strong customer base is crucial to the success of your business. To accomplish this, it is important that your branding suggests trust, dependability, and the professionalism that reflects your standards. You know you need to market your business in order to grow, but how do you get started? Due to budget or time constraints, or the desire to do-it-yourself, many businesses and individuals choose templates to fulfill their marketing needs. There are many platforms of marketing, including print, web, social media, or guerilla tactics. This post focuses on print materials, but similar methods can be applied to web based marketing. StockLayouts is the leading provider of professional graphic design templates, designed to provide you with ready-made marketing materials. Simply enter your company’s marketing message into the text boxes and you will already have an expertly designed, finished piece. StockLayouts designs are, however, fully customizable. You have the ability to personalize your layout and create a truly unique marketing piece of your own. 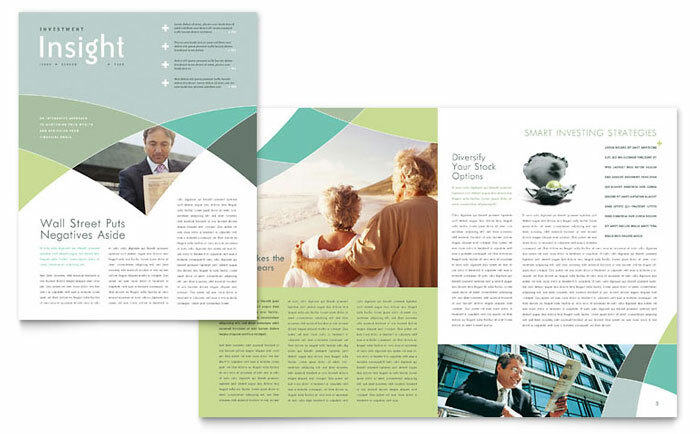 Have a look at the Financial Advisor Newsletter template to the left, personally one of my favorite StockLayouts designs. With minimal photo changes, and the ability to change all the colors, this design could be used for any number of industries: technology, medical, sports, real estate, non-profit, etc. As templates are meant to be altered, colors, photos and text placement should be one of your least concerns when selecting the right template. Always keep your audience in mind when browsing templates. Consider your target’s age, desires, personality, etc. Ask yourself what type of emotions should your business invoke. Will the design you are considering be enticing to your target audience? Certain color combinations depict the “feel” of a business or its industry. For example, environmental organizations use greens and earth colors, while a child daycare will use a bright, friendly color palette. Imagine what the design will look like in the appropriate colors. If you have already chosen your brand colors, simply change the graphic elements to match. If the included photos do not suit your organization, keep in mind that photos can be easily replaced. Insert your own photos, or stock photography can be purchased for a nominal license fee from companies such as iStockphoto.com. Like colors, the font face you choose for your marketing materials demonstrates the personality of your business. A safe and simple rule is to stick to a single font family for the body copy and choose a complimenting font for headings. To find professional fonts, visit our blog post on Font Resources. If you are a new business or an established brand looking to refresh your image, templates are an economical and easy way to create professional-looking marketing materials. You will be surprised at how minor modifications will give your piece a unique look that will distinguish it from the original and from the work of others. Try a free sample or start designing new marketing materials for your business today! Are there other considerations you take into account when choosing a template? Comment below! Colors have doubtlessly a huge impact on our mood and feelings. It is so important to choose the right colors in our life. I am painting through synesthesia which makes me see colors when I hear names and numbers. These colors I transform in paintings. Colors are my life. I am really enjoying reading your well written post. It looks like you spend a lot of effort and time on your site. I have bookmarked it and I am looking forward to reading new news. Keep up the good work! 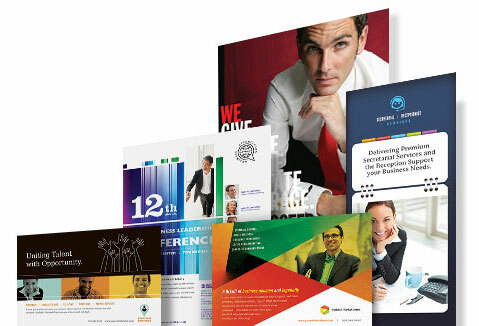 A professional graphic designer’s services will significantly increase your return on investment in marketing materials. Whether you choose to take advantage of templates like these to fill your marketing needs or hire a professional, you can always find a great online printing company who will provide high quality prints at a great price. Thanks for such a well written post. As you have mentioned, use of proper colors, images and fonts will make the template look more attractive. Another thing to keep in mind is the audience for whom the work is being done. Here all the above mentioned factors play a huge role for making the design popular.